It's not uncommon for an album to suggest the influence of another band's recent release. It happened regularly in the sixties as that decade's top acts...The Beatles, The Rolling Stones, Bob Dylan, The Beach Boys...were constantly responding to what the others had just put out. But it's rare for an entire album to feel like a direct response to a single song, let alone just the first two-thirds of a single song, and yet, that's exactly what seems to have happened on Oxford-based Foals fantasitic sophomore LP Total Life Forever. Somewhere between the release of their 2007 debut Antidotes , and the release of this album, the members of Foals fell in love with Radiohead's In Rainbows , or more specifically, fell in love with the opening two-thirds of that album's mesmerizing fourth track, the shimmering, swirling Weird Fishes/Arpeggi . The result was one of the best UK albums of 2010. It's a dramatic stylistic shift for the band. Where Antidotes was nearly all fast, jittery, assaultive, math-rock meets punk meets the dance floor buzzsaws, Total Life Forever is calm, soulful, immersive, anthemic...many of its songs, most notably the brilliant centerpiece Spanish Sahara, starting in extreme quiet before building to massive crescendos. And yet, what's most surprising about this stylistic shift, is rather than feel derivative, the closer the album's tracks hue towards Weird Fishes/Arpeggi's haunting underwater sound, the better they are. I attribute this to the sense that the band was never interested in mimiography. Instead, Weird Fishes, with it's complicated, interweaving, percussive guitar harmonics, opened Foals's eyes to how techniques they themselves had already employed could be put in the service of a radically different mood...a mood they repeatedly capture on tracks like Blue Blood, 2 Trees, Black Gold, Alabaster, the aforementioned Spanish Sahara, and epic jam After Glow. The material that less specifically references In Rainbows is by and large livelier, but of slightly lesser quality, though a number of these tracks, particularly the title track, the Madness-tinged This Orient, and the jaunty, early Cure-ish Miami still impress. So if your in the mood for a Radioheadish album that is in many ways more appealing than Radiohead's most recent release, King Of Limbs, definitely check Total Life Forever out. Cherry Picker's Best Bets: Blue Blood , Spanish Sahara , After Glow , 2 Trees . Here's the official video for album opener Blue Blood, and yes, that's the band playing in the opening moments before the kid takes the stage. 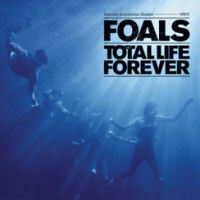 What are your thoughts on Foals and Total Life Forever. Let readers know with a comment below.